"loss of order"? That would make a great storyline! Hey JANG! Awesome MOC! I've been looking forward to seeing this one. I just knew that he was going to be a bat! Great head choice, I thougt the helmet was custom at first, but a few people on YouTube said it was from Ultimate Dume. I know who Dume is but somehow I have never seen the set... But now I need that mask badly! And I think those are the gunmetal wings, as opposed to black or dark blue? Also on your YouTube video you said that you are working on a self MOC... Lorne as a hero would be awesome. Just putting it out there. Also, I agree with the above comment that a storyline about 'loss of order' would be cool... Is it part of the upcoming Zeyek storyline? Nice!! Is that a custom head, or an old bionicle one like you used for surge? SO COOL... This MOC is pure awesome. 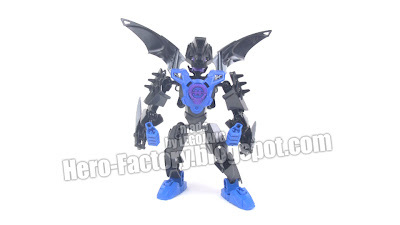 Great head choice, and NPU with the Phantoka Makuta wings. The "Hero Recon Team" is just a front for the the orginazation known as the HRDS, or Hero Reconnaisance Defense Squadron, co-led by Specter and Onyx. A high-ranking member of the HRDS, Merrick Fortis, and his assistant Vic Tory, are tasked with the running of the "Hero Recon Team". Members of the HrT are not told initially about the HRDS, however if they gain elite status within HRT, they join HRDS. Just an idea. Ignore it if you want, or use it, fine either way. epic moc ! i love the idea of there being a darker side of hero factory ( mostly because i miss the more complicated, darker story of bionicle) but also because it would be a great addition to hf story! so nice work on this one! @Anonymous: It was a Kanohi Kraahkan from the Ultimate Dume exclusive set. It is a very rare mask though, and costs $10 on Bricklink. You should try and make a Blanko 3.0! And make him have the power of a parrot (because he is heaps of different colours like a parrot and he has a dumb personality). Now that would be awesome! @ Anonymous: Or a chameleon because like Blanko, chameleons possess many colors (while in camouflage) and because like the goggles he wears, chameleons have bug-out eyes. or blanko could be... I have no idea what else he could be. blanko 3.9? it could be a good idea. I like Secter 3.0 but will you make Secter 4.0?